The tiny, butterfly-shaped island of Boracay in the western Visayas is a major hotspot for international sun-lovers, and has become one of the Philippines' most popular resort destinations. Thousands have sung the praises of the powder-white, palm-studded beach, which stretches for two miles (4km) and is said to glow at night. Despite its popularity Boracay remains impressively unspoilt, offering a range of about 350 hotels and guesthouses, a fun nightlife, good restaurants and a huge array of water sports. The island's dress code is barefoot and informal, and the transitory holiday population is truly international. 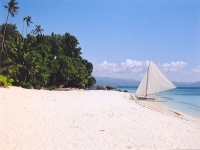 Boracay has won multiple awards and is lauded as one of the best beach resort destinations in the world by various travel authorities and magazines. The main tourist area, White Beach, is on the western side of the island and the best time to visit is during the Amihan season, between October and May, when there is little or no rain and the prevailing wind blows from the east, leaving the west of the island calm and sheltered. For those who tire of relaxing on beautiful beaches, activities include scuba diving, snorkelling, windsurfing, kiteboarding and cliff diving.